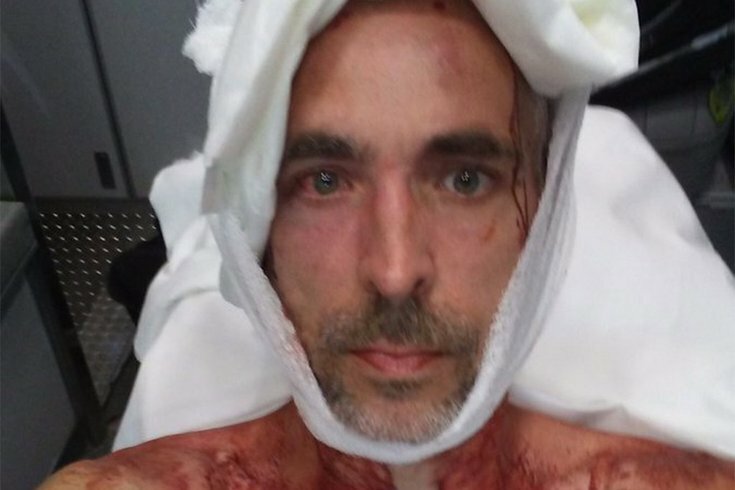 Howard Caplan, best known as the 'Hillary for Prison' and 'Pizzagate is real' sign man on Roosevelt Boulevard, was assaulted after pro- and anti-Trump rallies in Center City on Sunday, July 1, 2017. “Next thing I know, I’m on the ground," he said of the attack. "Felt like they hit me in the head with a bottle." Does the name Howard Caplan ring a bell? If so, you’ve likely heard about how the 48-year-old Northeast Philadelphia resident holds signs along Roosevelt Boulevard urging passersby to put Hillary Clinton in prison or research the “Pizzagate” conspiracy. On that latter mission, he once burst into the Cathedral Basilica of Saints Peter and Paul to deliver a tirade during Christmas Mass. Now, we can add another chapter to Caplan’s narrative: On Sunday, he was jumped by counter-protesters at a series of protests in Center City. Antifa, short for anti-fascism, is a Philadelphia group that says its mission is to "monitor and confront fascism, racism, and oppression of all kinds." Its web site makes it clear that members were planning to confront Trump supporters on Sunday, but it unknown at this point whether the assailants were members of the group. Caplan certainly believes they were. Suffice it to say, the news went viral in the community that stands by his side. With Sunday's concurrent rallies bringing in close promixity a group calling for the impeachment of President Donald Trump, another backing him staunchly and Antifa, things seemed destined to bubble over. On Sunday, July 2, 2017, at 12:43 PM, Officer(s) assigned to the Trump protest at 16th & Cuthbert Sts., and was making an arrest of a male Offender #2 who was seen punching a Trump supporter (31/W/M), in the face and pulling the American flag from him. While arresting Offender #2, an Officer was intentionally hit from behind by Offender #1, striking the officer in his left shoulder and back, knocking the Officer over hitting the sidewalk, in the attempt to keep the Officer from arresting Offender #2. Other officers on the detail quickly apprehended Offender #2. A third male, Offender #3 was also being arrested at the same time, for punching the same Trump supporter in the face, splitting his lip. While arresting Offender #3 he resisted arrest, and found in his possession were two flares, and a plastic bag of potassium chlorate. Those items were confiscated by the Bomb Squad. The Officer sustained a cut on his knee and shoulder pain. Offender #1: Daniel Vieira, 32 W/M, from New Haven, CT. But those arrests were separate from the assault Caplan says left him with six staples in his head, a “pretty messed-up” left eye, a scratched cornea and scrapes on his leg. “There were two rallies going on: One to impeach Trump and a pro-Trump rally. I went to (impeach Trump) first with a Trump 2020 sign to troll that for a while. There were police all over. I was getting yelled at a little bit, gave a couple interviews to the media. Then, they went on their way. I didn’t see the Antifa dudes if they were there. “While that was going on, the pro-Trump rally was getting started in Old City. About 11 or so, (the impeach Trump) march got on their way, so I joined with the pro-Trump people as they came up Market Street maybe a half hour later. It wasn’t that big of a deal. We marched up to the Ben Franklin Parkway and that was it. It was over and done with. “I knew that Antifa said they’d be coming, but didn’t notice them. It was pretty hot out, so I was hanging out by (Swann Memorial) Fountain (in Logan Circle). I was just talking to an old-school South Philly guy and his girlfriend. They left. I hung out for another 15-20 minutes or so and started walking back to catch the El. “I was holding my sign at my side, not flashing it or anything. Everything was over. When I get between 16th and 17th streets, some dude comes up to me and says, ‘Hey man. What’s the sign say?’ He said it in a really nice way. I turned and looked and saw guys behind him. There were six of them, not three, definitely. I didn’t know what was going on, then, boom, everything happened so fast. “Next thing I know, I’m on the ground. Felt like they hit me in the head with a bottle. They were stomping me a bit while I was fighting them off. They scattered. I looked around, disoriented, thought they stole my backpack but they didn’t. “Reaching for the backpack got me up off the ground. They ran in different directions. I looked toward 16th Street and saw two of them running so I started chasing them, yelling “Call the police! Call the police!’ One of them was fat. He was huffing. They ran to the subway station, down a long corridor and I’m staying with them. “There was a transit cop there, and I yelled ‘f****** get him!’ Fat boy got caught. I recognized the other guy because of the shirt he was wearing. I noticed it earlier in the day. They both got caught and so did the third one. “The other arrests are from a different case. But, I saw them catch all three that jumped me. The detectives came to see me at Hahnemann (hospital) to get details. It’s more complicated than the other case since they didn’t see the incident. “I have a black eye, six staples in my head, a scratched cornea. It’s weird, man. When I was washing the blood out of my hair, I felt glass scratch my eye. They checked my eye and it seems OK, though. I’ll be alright. Caplan said he’d let us know when he hears about his alleged assailants being formally charged in connection with the case.